Topricin provides pain relief by improving circulation and attracting and stimulating the body's healing chemistries at the site of pain. Topricin delivers reliable pain relief, improving quality-of-life, and providing a strong adjunct to professional care with no side effects or contraindications. No odor, non-greasy, no parabens, no known side affects. 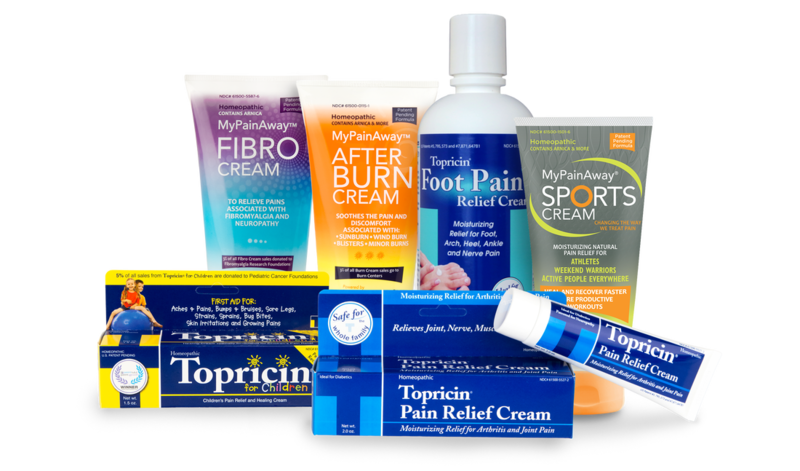 Topricin has been bringing superior, safe, effective pain relief to the Medical and Natural communities, their patients, customers and clients since 1994. Topricin Foot Pain Relief Cream is safe and effective for leg cramps, Nerve Pain, Gout, Plantar fasciitis, Achilles tendonitis, Heel, foot and ankle pain. Relieves itching, cracking of the skin and joint pain in the toes and feet. Patented for topical treatment of neuropathy. APPLICATION: Generously apply 3 to 4 times daily or more if needed, 3 inches on and around affected area. Massage in until absorbed Reapply before bedtime and in the morning Use before and after sports workouts and competitions Apply immediately for acute trauma (sprain, strain, bruise, impact or crushing injury). USES: Relief of inflammation & pain, and healing treatment for soft tissue & trauma injuries, reduces swelling, stiffness, numbness, tingling & burning pain associated with thesesoft tissue ailments: Edema swelling and joint pain in the toes, feet and ankles, Heel pain/soreness (heel spurs), Bunion pain/soreness (big toe), Nerve pain (burning pain in the feet), Gout (pain in big toe), Arch pain, soft tissue pain, and ball of the foot. Fibro Cream is a soothing combination of natural biomedicines that rapidly relieve pain, while helping the body to heal the damage that is causing pain. Finally, Chronic pain sufferers can experience safe, effective, natural pain relief. Patented and proven to be effective for treating the pains of fibromyalgia, MyPainAway FIBRO Cream is specially formulated to help you live a pain-free life. Odorless and grease-less, MyPainAway Cream brings a soothing combination of natural biomedicines that rapidly relieve pain while helping the body to heal the damage that is causing pain. Free of Chemicals, No Side Effects, Safe for Diabetics and Pregnant Women. APPLICATION: Apply MyPainAway 3-4 times a day to painful tender points massage in until absorbed. For best results reapply before bed and in the morning. Women suffering with fibromyalgia will love that MyPainAway FIBRO Cream helps to get the first trigger under control so they can enjoy the day and then sleep like a baby at night. A Powerful Blend of 17 Active Bio-Medicines: From the trails to the track, in the gym and on the water, sports related pain can strike anywhere. Help your body repair the damage that causes pain by applying MyPainAway Sports Cream. This new formula from the experienced creators of Topricin utilizes 17 powerful biomedicines to stimulate the body on a cellular level; increasing the rate of healing in order to reduce the pain at its source. MyPainAway Sports Cream is specially formulated to naturally and effectively treat all pains associated with intense physical activity. This unique and powerful treatment addresses the pain by stimulating the body’s own power to heal itself, thereby preventing the painful sensations at their source. Free of paraben and without petroleum or irritating chemicals, MyPainAway Sports Cream uses only natural ingredients to bring down swelling and stop the pain fast. Apply generous amounts 3-4 times daily, or more often if needed. Apply 3 inches on and around affected area. Massage in until absorbed, reapply before bedtime and in the morning. Use before and after physical activity. Apply immediately for acute trauma injuries (sprain, strain, bruise and impact injuries). How does it work? MyPainAway Sports Cream drains toxins and fluids in an injured area, improving blood flow to the injured tissue. Fast. Effective. Odorless. Natural. After-Burn Cream is a soothing combination of natural biomedicines that is the safe, natural alternative to chemical-based lotions and ointments. One application soothes the skin to revitalize, restore, moisturize and provide vibrancy. If you’re in the sun [beach, travel, sports games…] a must-have to have on hand. How to Get the Best Results with MyPainAway AfterBurn Cream - Apply MyPainAway 3-4 times a day to painful tender points massage in until absorbed. For best results reapply before bed and in the morning.